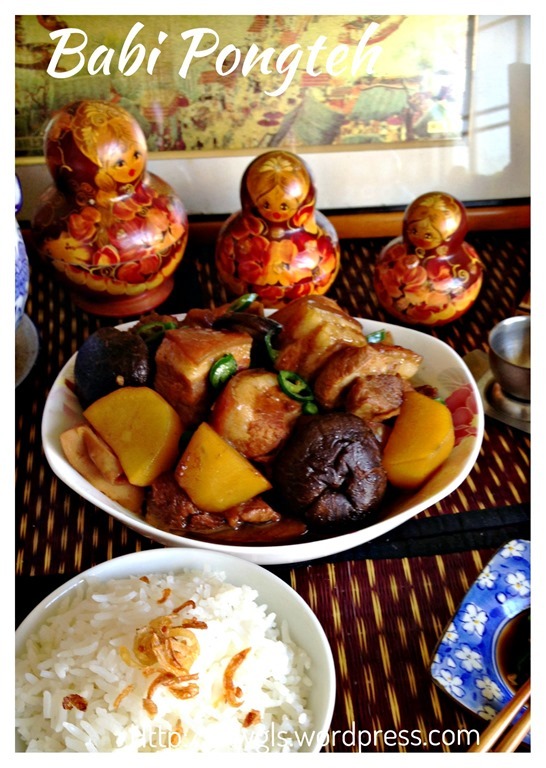 When I was reading books of Nonya cuisines, the word Pongteh always caught my eyes. 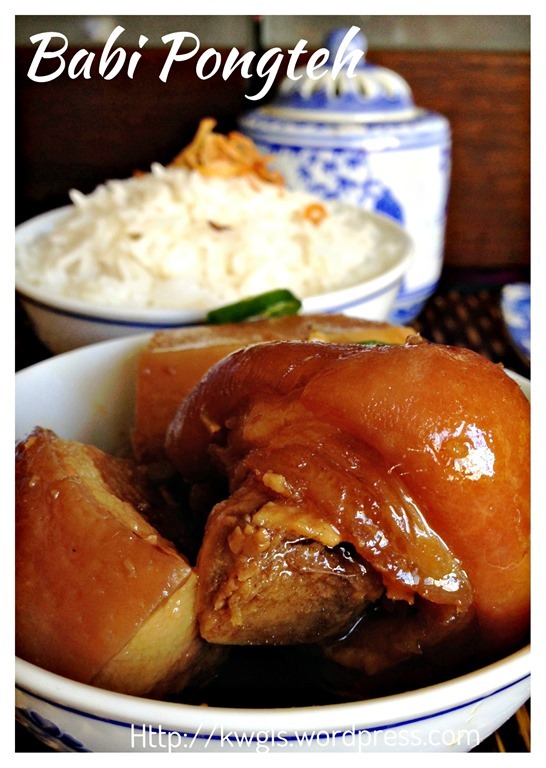 Frankly speaking, until today, I still can’t trace the origin of the word “pongteh” and possibly it is have something to do with the word “tea” in Hokkien. 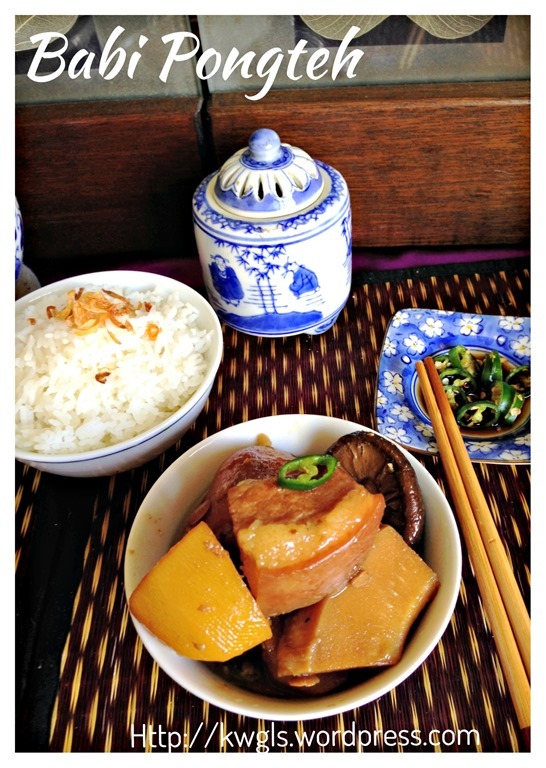 Apparently, it is a signature dish of the Peranakan Society that every nonya household can cook and usually served in important occasions. 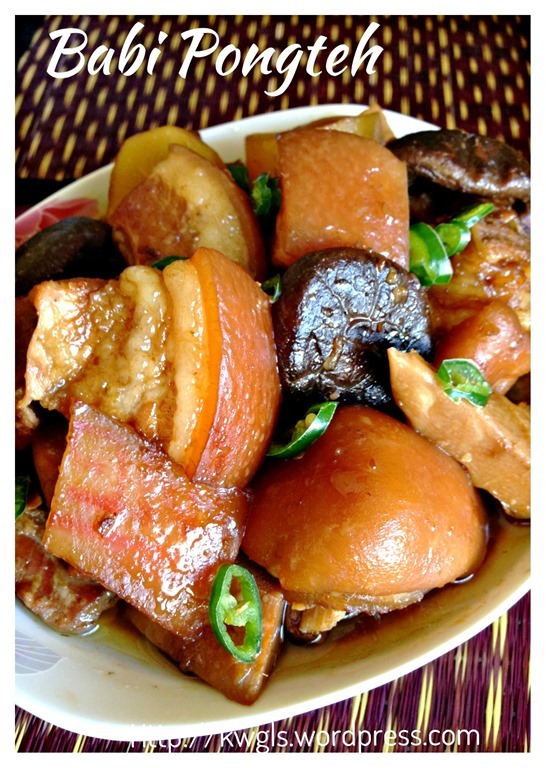 After reading through the various recipes of pongteh, what I can summarize is that it is a type of stew meat (either chicken or pork) and braised long hours with fermented soya bean paste, onions, potatoes, black mushrooms and sometimes bamboo shoots. The meat shall be braised until it melt in the mouth. I can’t claim that this is the authentic version but this is what I have learned from the internet and I hope that it do meet the standards of the Peranakans. I have selected using pressure cooker to expedite the preparation. 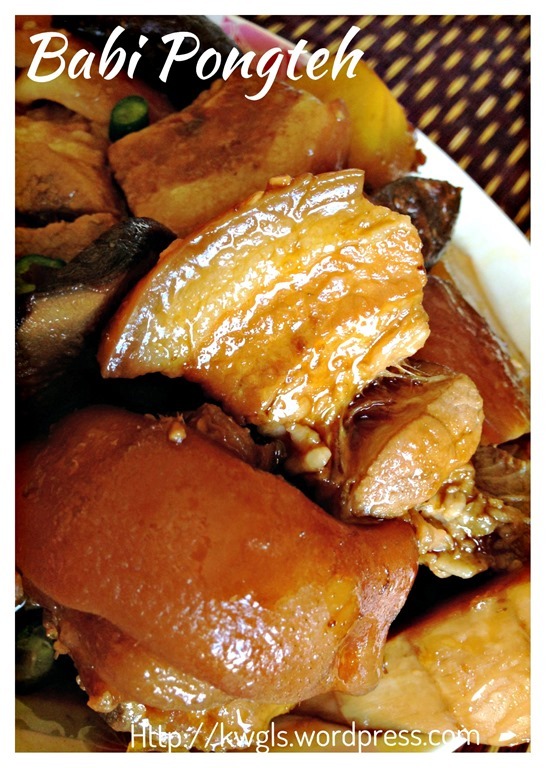 The outcome of the meat is soft and with the fragrance of the fermented soya beans. One regret is the type of potatoes used. 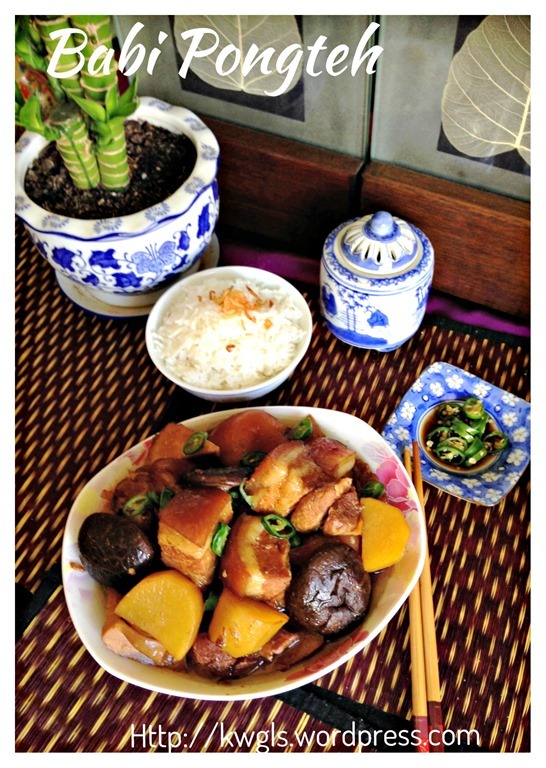 It is the type of potatoes that will not “disintegrate” despite long hours of cooking. Possibly I should used those that are suitable for the preparation of mash potatoes. Then the disintegration of the potatoes will coat the meat and others making it looks more authentic. In a pot of boiling water, blanch the meat until the exterior is cooked. Drain and set aside. 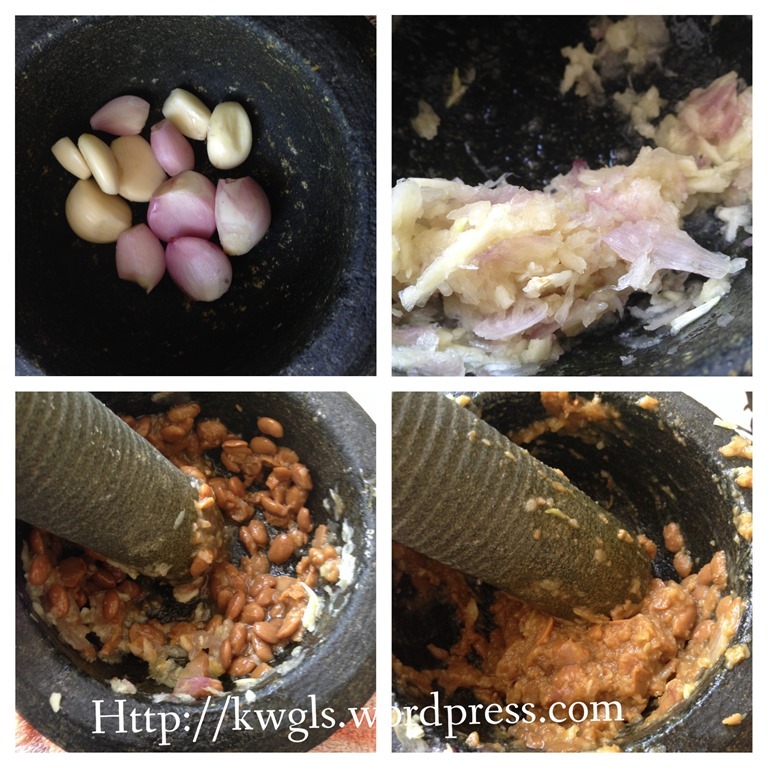 In a frying pan, put the cooking oil, sauté the garlic-shallot-fermented soya bean paste until fragrant. 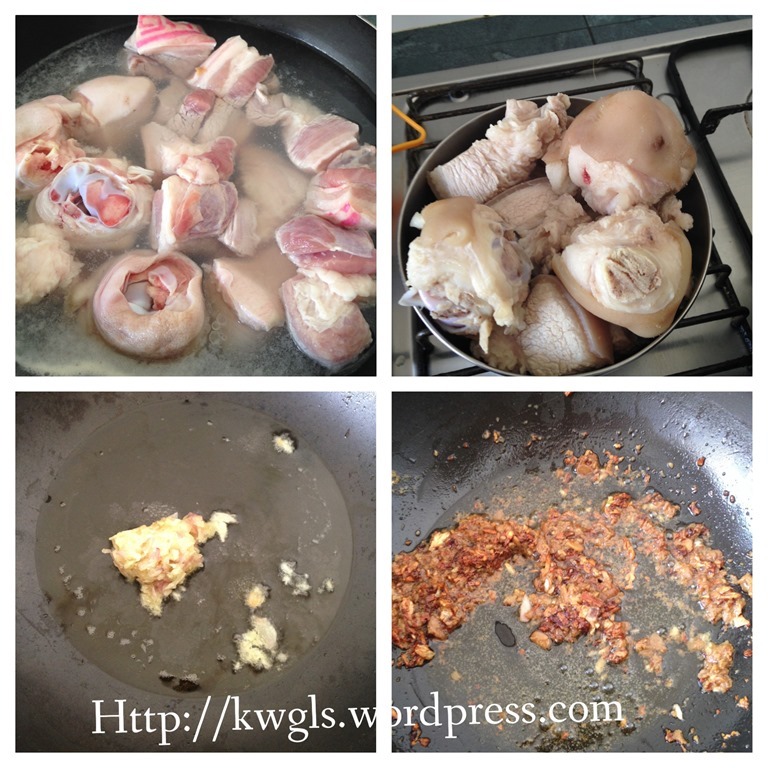 Add the blanched pork knuckles, stir fry for 3-5 minutes until well mixed. 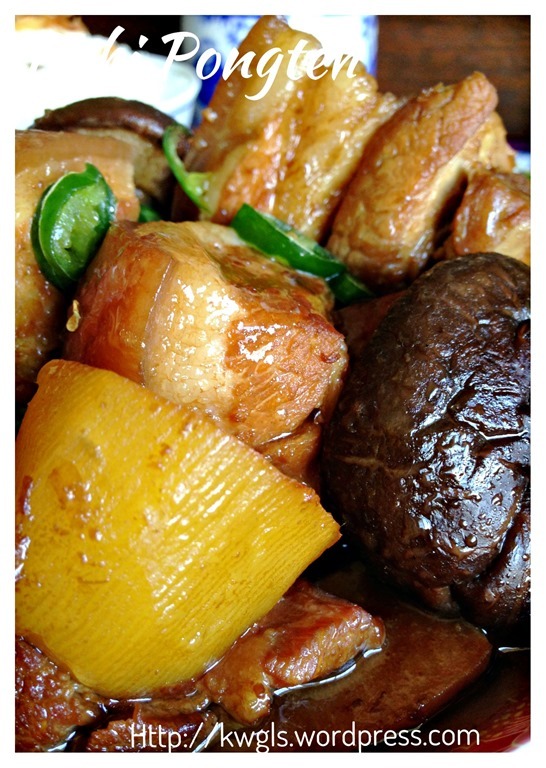 Add in winter mushrooms, bamboo shoots and potatoes, stir fry for additional 1-2 minutes until well mix. 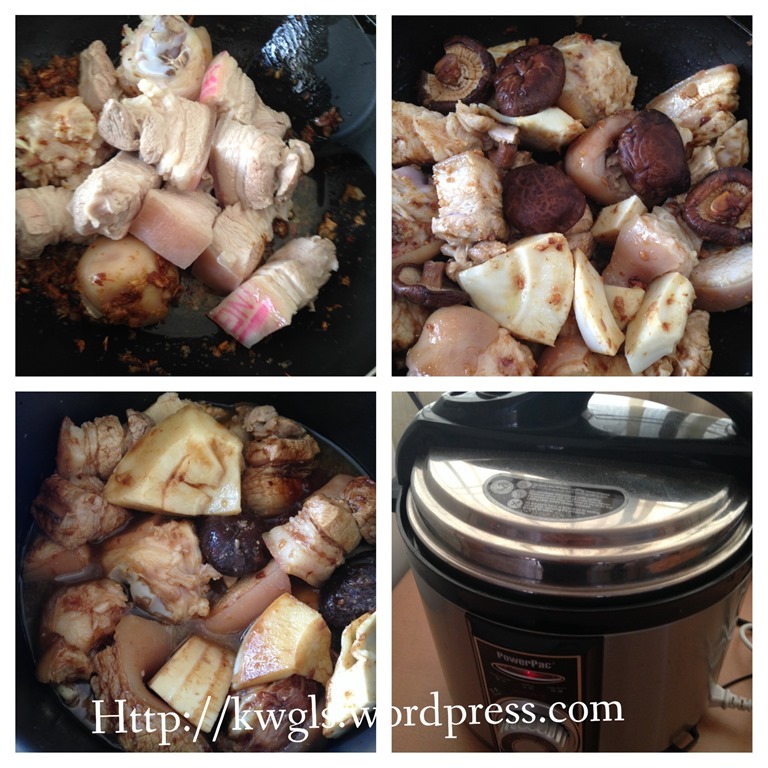 Transfer to the pressure cooker, add gula melaka, dark soya sauce, light soya sauce and just enough water to cover the meat. 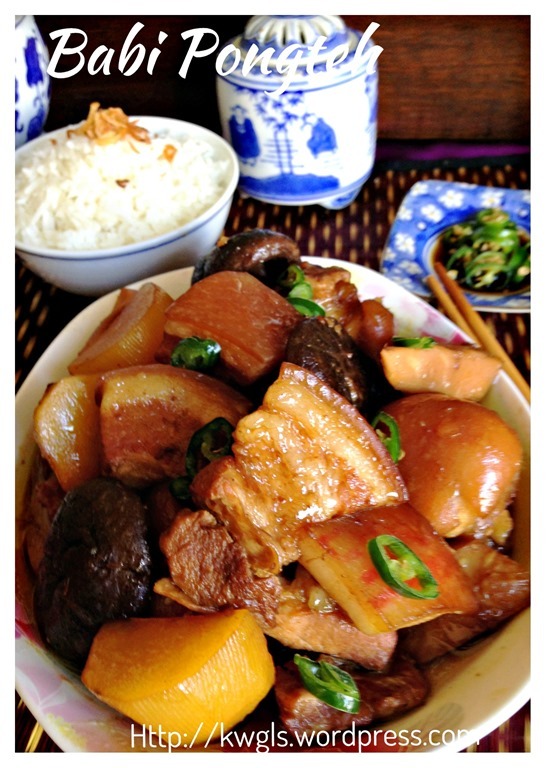 Use the meat function to cook for one cycle about the meat is soft. 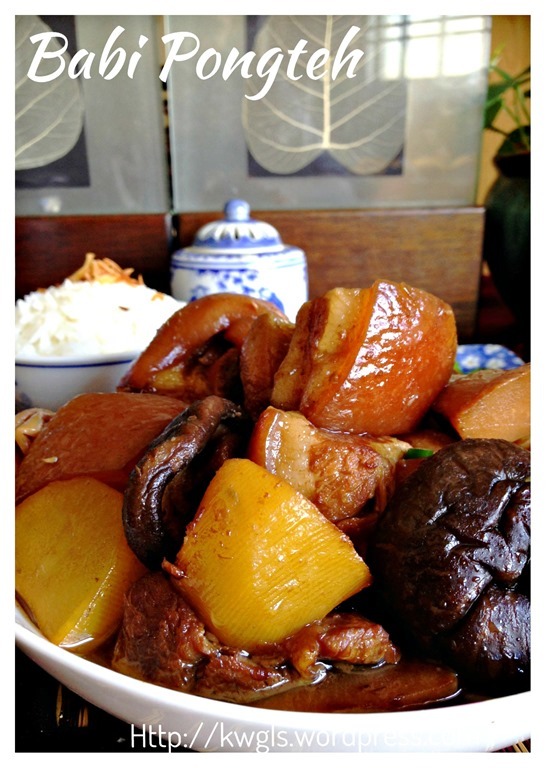 If you are not using the pressure cooker, you can stew the meat over the stove and it will take about 1.5-2 hours. 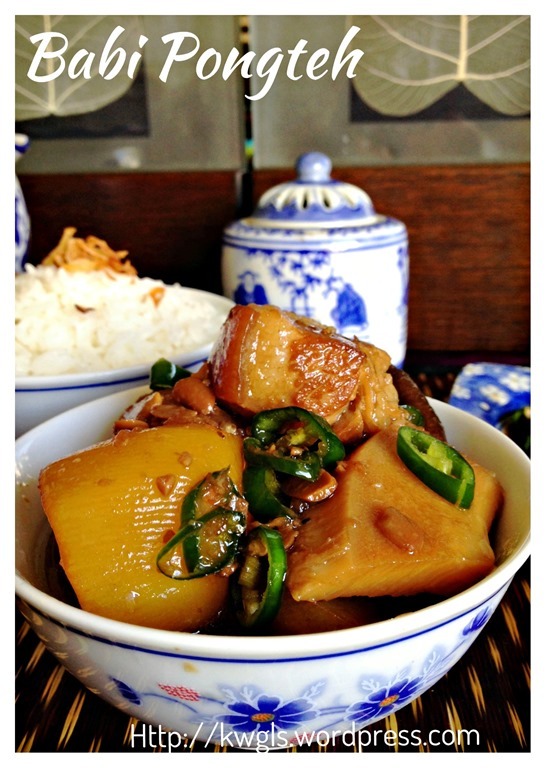 To me, this is a very special dish. 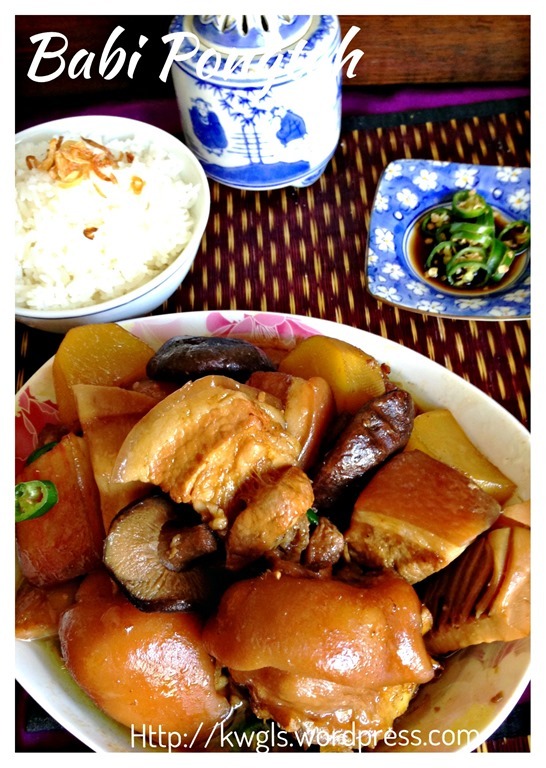 I have never ever thought to braise pork knuckles with fermented soya beans. I love the dish very much. 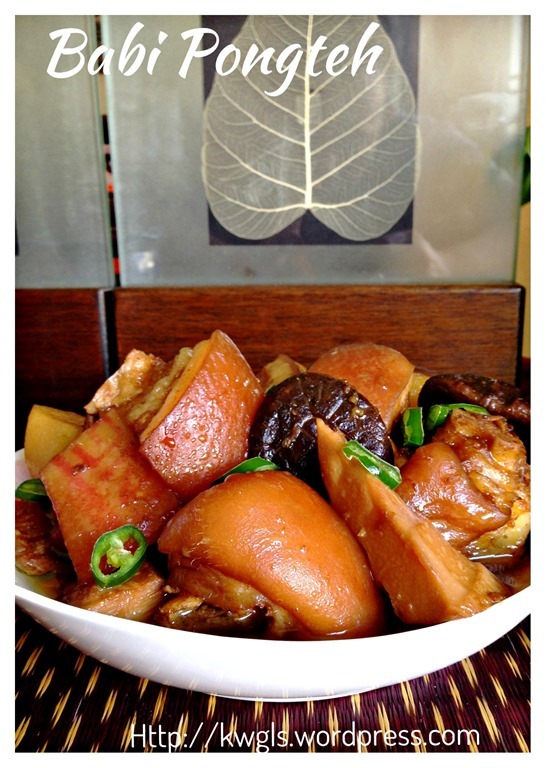 It melts in your mouth with aroma of meat, spices and fermented soya beans. I will definitely prepare the dish again. 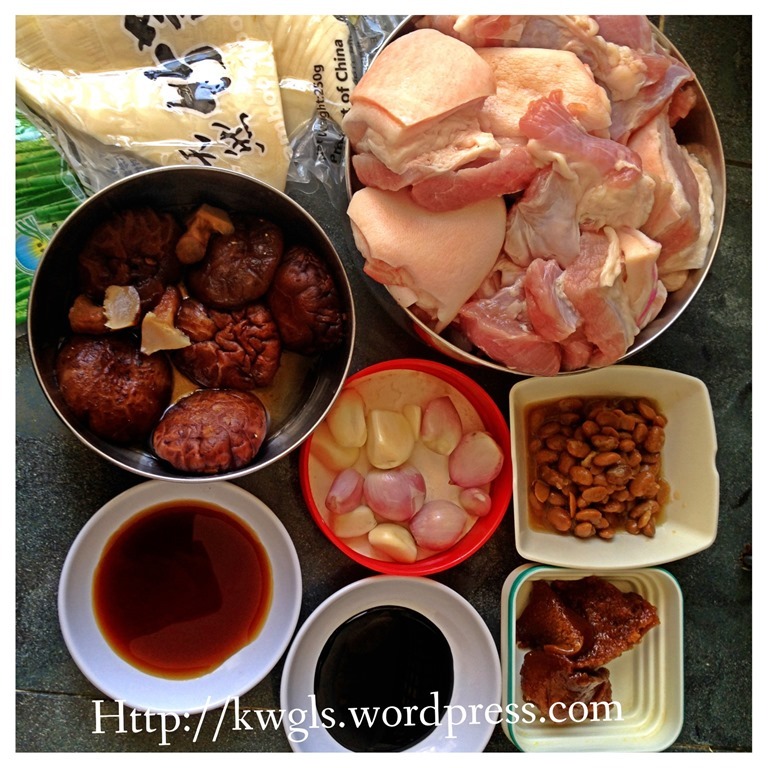 This entry was posted in Dish, Food Preparation Series, Meat Dishes and tagged 8, ayam pongteh, Babi pongteh, GUAI SHU SHU, Guaishushu, kenneth goh, nonya babi pongteh, nonya dish, postaday, 娘惹豆瓣酱燜蹄膀. Bookmark the permalink.